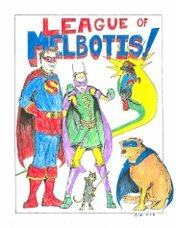 League of Melbotis: Super Cool! My post on Captain America from the other day got picked up by Blog@Newsarama. Thanks to Jim for finding the article. Also, the League was part of something really great this week, partaking in the 10th anniversary retrospective of the film "The Zero Effect". Visit Chronological Snobbery to read a huge amount of information about this little known, but much loved film. heck, even star of the film Bill Pullman is reading it. The League made a comment or two about Pullman's performance I now feel were a bit not-right. I am going to post on that later. Mr. Pullman has a Saturday afternoon basic cable viewing of "Spaceballs" to thank for me realizing what a bizarre and wide variety of stuff he's been in, from Spaceballs to Lost Highway to ID4. And all pulled off with aplomb. Mr. Pullman, I salute you. good work on being picked up - excellent writing will out. I've never seen Zero Effect, but Justin once told me Bill's character employed a version of "coat twirling", which is favorite meditation technique of mine.